Greetings, fellow open minded beings and all round awesome folks! 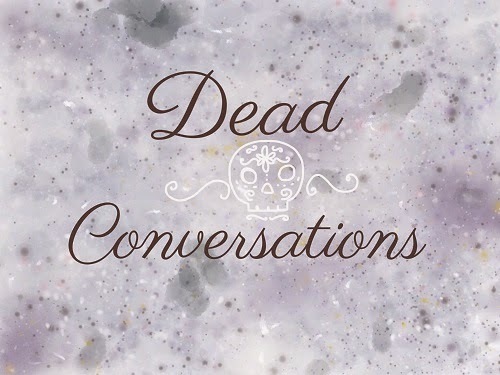 So I have some big plans for Dead Conversations. It is one of the positive, motivating factors in my life even during the worst part of my illness. Your letters and readership mean so much to me and continue to be a source of healing and hope. I want to get more involved and bring more content and experiments and different media such as videos and photographs and such. Guided Meditation Audio/Video by myself - basically tools I have found helpful to developing and opening the senses necessary for spiritual contact and the Connected Inside. Explanation! When I am in deep openness of mind and spirit, there is a place my mind and senses go that allow me to see such amazing things: some call it the Astral Plane, others call it the Ether, Universal Consciousness, some call it a Psychic Highway (I like that description!) and others make up allll sorts of names and descriptions of so much variety and great poesy and wisdom that blows the mind. For me, I try not to label things, but labels are good for communicating and so I will use something that feels right to me: The Connected Inside. It is so deep inside consciousness, at the barrier between conscious and subconscious - and yet it is connected to so much. From what I have read, the countless articles, books and sacred texts - it seems to connected to the Collected Consciousness / Universal Consciousness but also it accesses the deepest, oldest part of yourself and purest part of yourself. Sometimes I spend way too much time there, but I always find something, some tidbit of life changing information or perspective change or spiritual connection. I want to share this and help in your quest for spiritual awakening. My quest is never done, I don't think there is such a thing as an end to it, not as an embodied soul - but that is only opinion. Representation of Auras and Spirits - I have been asked and I'd like to show you what I, personally see, with the caveat that auras are hard for me. Why they are hard is that when I am about to have a migraine (can be daily, weekly, monthly) - I also see haloes, which are glowing lights people see in the beginning phases of migraines. So Sometimes I am unsure as to what I am seeing. Forum for you to connect to others in the same or similar quest for the hidden worlds. Reader Mail segments where I answer mails on the website itself. I have issues balancing letter-writing and writing of this journal AND the medical treatments I need to do daily - It has long been suggested that I do letters on here. Facebook and Twitter accounts, if the forums don't work out as well as I hope. I am not one for big site socialization, as anything you say can be used by those companies.. I really dislike that. I would hate for your privacy or intellectual property would be stolen. The thing I like about this blog is that it is a cozy family, a trusted space for me and hopefully you. Twitter would seem to be useful to announce new posts, hopeful live-streams one day, and videos etc for those who use it often. Lastly, experiments! My favourite thing! An example of an experiment is to get some sensory equipment while I am in the same room as a spirit, or while I am doing a reading - to see what is set off, and what is not. Another example would be trying to connect with a historical figure, or doing past life investigation. Today I think I might actually finish a video today, and if so - I will add a link when I finish! Thank you for reading. Have a sweet day!